We’d love your help. Let us know what’s wrong with this preview of 1994 by Ibrar Malik. 1994 was a watershed year for F1 in so many ways, the fatal accidents of Roland Ratzenberger and Ayrton Senna shook the sport to its core. What followed was mayhem. For the first time all the arguments are painstakingly examined in one book. 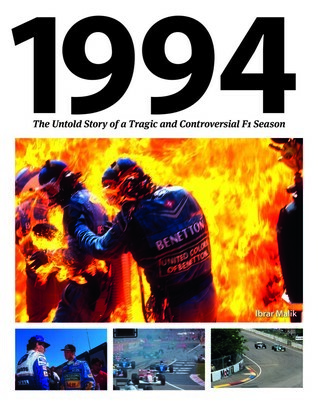 Fresh insights, exclusive interviews, and a plethora of evidence is brought together in a story that is guaranteed to amaze and shock 1994 was a watershed year for F1 in so many ways, the fatal accidents of Roland Ratzenberger and Ayrton Senna shook the sport to its core. What followed was mayhem. For the first time all the arguments are painstakingly examined in one book. Fresh insights, exclusive interviews, and a plethora of evidence is brought together in a story that is guaranteed to amaze and shock. It will be published in January 2019, but you can pre-order your copy now. It also saw Michael Schumacher and Benetton first emerge as championship contenders, upsetting the establishment. Many believed their sudden rise was down to cheating, whilst others felt they were scapegoated because of politics. For the first time all the arguments are painstakingly examined in one book. Fresh insights, exclusive interviews, and a plethora of evidence is brought together to give the clearest analysis yet into the above events. The book contains over 250 photos which help bring this story to life, many of which are rare and from those involved. There are exclusive contributions from former F1 driver Mark Blundell, Benetton insiders: Willem Toet, Frank Dernie, Simon Morley (the “junior employee” blamed for the Hockenheim fire). Williams’ insiders Paul West and Richard Wise. You will be astonished at what is unearthed. 1994 was tragic, chaotic, political, technical and involved some very colorful characters at the heart of the action. It’s a story that will amaze. ′ Did Senna hear illegal traction control on Schumacher’s Benetton at Aida? ′ Concealed launch control was later found on Schumacher’s Benetton. Why? ′ Was the Hockenheim fire caused by Benetton removing their fuel filter? ′ Despite pleading guilty, why did Benetton receive no serious punishments after the fire? ′ Schumacher was banned / disqualified from a quarter of 1994 races due to various infringements. Politics or cheating? ′ Did a return to simpler cars contribute to the accidents? The book seeks to answer these and many more questions. "As a contributor, I got to read the latest version recently. A Sterling effort by Ibrar Malik"
To ask other readers questions about 1994, please sign up. I am a massive F1 fan and 1994 holds special memories. It was the first year I followed the sport and I spent my childhood playing “Grand Prix 2” – a computer game based on that season. This book arose because there are constant rumours Schumacher, Benetton and others may have cheated that year, but the reasoning behind these allegations were not always sound. Since 2015 I’ve been determined to fin I am a massive F1 fan and 1994 holds special memories. It was the first year I followed the sport and I spent my childhood playing “Grand Prix 2” – a computer game based on that season. This book arose because there are constant rumours Schumacher, Benetton and others may have cheated that year, but the reasoning behind these allegations were not always sound. Since 2015 I’ve been determined to find out the truth and have therefore researched all the books, internet sources and magazines (Autosport, F1 News and Motor Sport) covering this subject. Furthermore I’ve interviewed various key figures employed by Benetton, Ford Electronics and Williams. In addition, I’ve studied all the on track action from 1994 – because “common sense” evidence is often forgotten when discussing this subject. The book is the fruits of all that hard work and research.